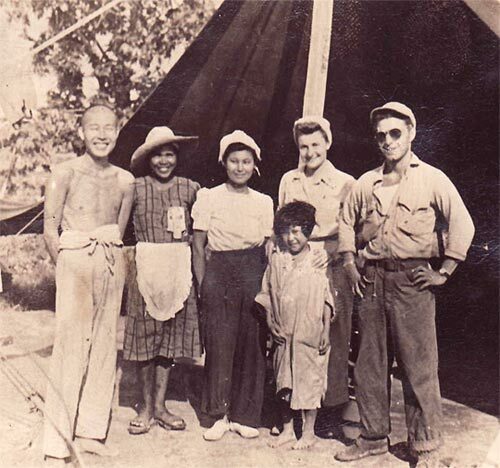 Guy Gabaldon (right) poses in a group that includes Japanese prisoners in 1944. 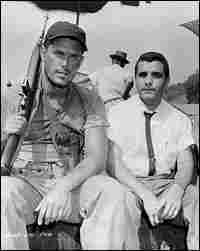 Jeffrey Hunter (left) played Guy Gabaldon (right) in the 1960 feature film Hell to Eternity. Documentary filmmaker Steve Rubin says the former Marine's Hispanic heritage was ignored in casting Hunter. 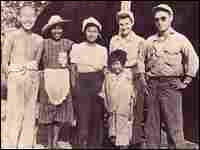 In 1944, during the bloody fighting for control of the Western Pacific island of Saipan, Marine Pvt. Guy Gabaldon single-handedly captured more than 1,000 Japanese soldiers — a feat never before accomplished in U.S. military history. His secret weapon: the diminutive Mexican American spoke Japanese. Two years after his death, a documentary questions why he wasn't awarded a Medal of Honor. Gabaldon learned Japanese growing up among Japanese Americans in East Los Angeles during the Depression. "My ability to speak Japanese was very limited," Gabaldon told NPR in 2000. "But it wasn't difficult to say, 'Raise your hands and come on out.' At night I'd usually go to caves — Saipan is just full of caves — and I'd get to one side of the mouth of the cave and I'd say, 'You are completely surrounded. I've got a bunch of Marines here with me behind the trees. If you don't surrender, I'll have to kill you.' And usually it worked. Not always. I'd have to throw grenades in and kill. And I'd [capture] maybe 10 or 15, 20 [Japanese soldiers] at a time and one day I got 800." Gabaldon died in 2006 at age 80. For his war service, he received the Silver Star, which later was upgraded to the Navy Cross. Now, as the memories of his heroics fade with time, the Pentagon is considering awarding him a posthumous Medal of Honor, the nation's highest military recognition. And a Hollywood filmmaker is releasing a new documentary about the World War II hero. America first learned about Gabaldon in 1957 when he appeared on the popular television show This Is Your Life. That appearance turned the truck driver into an instant hero and Hollywood soon came knocking on his door. In 1960, Gabaldon's story was turned into a feature film called Hell to Eternity. The movie featured some of the most realistic combat scenes shown up until that time. But it also took certain liberties with Gabaldon's story. 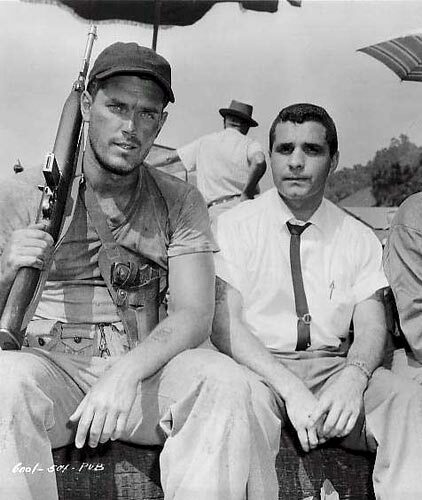 The 5-foot-4-inch Marine was portrayed by 6-foot-1 actor Jeffrey Hunter. "The biggest glitch in the movie is that Guy Gabaldon is portrayed as a Caucasian living with Japanese Americans," says filmmaker Steve Rubin, who has made a documentary about Gabaldon. "That was completely inaccurate. His Hispanic heritage, his ethnicity, his whole background, was obliterated and plays no reference in the movie." Rubin was just a kid when he saw Hell to Eternity, but the story of the Marine who spoke Japanese always stuck with him. Years later, through a series of coincidences, Rubin met the man himself. "I get a phone call at home around 8:30 at night and lo and behold it's Guy Gabaldon calling me!" Rubin says. "And he was very apologetic and he says I'm sorry to call you so late. And I just say 'Guy!' It's like hearing from Davy Crockett! I was just blown away that I was on the telephone with one of my childhood heroes." The two men became friends and Rubin eventually produced a documentary about Gabaldon called East L.A. Marine. One of the central questions he asks is why Gabaldon was passed over for the Medal of Honor. The Pentagon is reviewing the cases of about 80 Hispanic and Jewish-American World War II soldiers to determine whether they should be awarded the Medal of Honor. A spokesman confirms that Gabaldon is among them.